A networking meeting of the "Make Rojava Green Again" campaign took place this weekend in Geneva. The ecologically focused activists also showed solidarity with the hunger strikes in Turkish prisons. 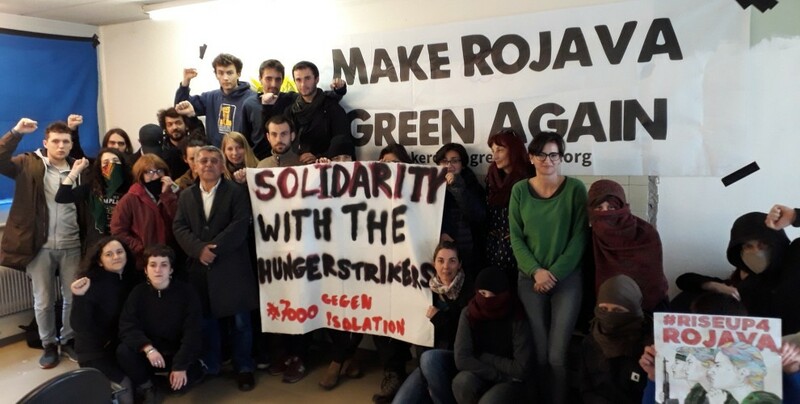 This weekend around 30 delegates and individuals from six different countries met in Geneva, Switzerland, for the ecology campaign “Make Rojava Green Again” (MRGA). They discussed how the reforestation work and other ecological projects implemented in Northern Syria within the framework of MRGA can be supported from Europe. There was also a discussion about what connects the different ecological struggles and resistances in their home countries. In addition to the concrete projects in Rojava and actions of practical solidarity, MRGA should form an interface between grassroots climate and ecological movements as well as anti-capitalist and anti-imperial struggles, gender liberation, and the Kurdish Freedom Movement. The book of the campaign, which has already been translated into various languages, gives a deeper insight into the connections between the social and the ecological question. After the European conference, many of the attendees also visited Kurdish activist Mehmet Ali Koçak on day 54 of his hunger strike in solidarity and to learn more of the revolutionary resistance at this critical point in history: with the 7000 hunger strikers protesting in Turkish prisons and in Europe against the fascist politics of the Turkish state, the imprisonment of thousands of Kurdish activists and the isolation of Abdullah Öcalan. Solidary greetings were also given to MRGA activist Anne from Copenhagen, who is currently being held by the Danish police in Denmark to prevent her from leaving for Northern Syria to support the ecological work there. More information about her case will be posted on makerojavagreenagain.org within the next few days.